BOZHKOVA Anna, Doctor EMC. Make an appointment, ask a question. In 2005, doctor Bozhkova had graduated from Moscow Medical Academy named after I.M. Sechenov with a degree in general medicine. In 2005, she was completed ISOS international training on medical evacuation. From 2005 to 2007 she was trained in clinical residency at the Department of In-patient Therapy No. 2 of the Department of General Medicine on the specialty of therapy at SEI HPE MMA n.a. I.M. Sechenov. In 2007, she completed her training at the Department of Therapy No. 1 of the Moscow State University of Medicine and Dentistry on the program of supplementary professional education in clinical electrocardiography. In 2004-2011 she completed ISOS BLS, ACLS and ATLS annual trainings. In 2012, she received additional training on the specialty of General medical practice/family medicine at the Department of Family Medicine of the faculty of postgraduate professional education of physicians at SBEI HPE First MSMU n. a. I. M. Sechenov. The sixth School for advanced training for rheumatologists, endocrinologists, gynecologists, internists, traumatologists and other specialists in osteoporosis issues (April 2017, Moscow). She is a participant of annual conferences on general and family medicine. From 2003 to 2007, doctor Bozhkova had been working in the Urgent and Emergency Care Units of EMC as well as in the International SOS Clinic. She has an experience in medical evacuation both in Russia and abroad using special air ambulance ISOS and commercial aviation. From 2007 to 2013, she had been working in the Federal State Budgetary Institution "Hospital with polyclinic" of Administrative Department of the President of the Russian Federation in the position of a General practitioner of In-patient Department. 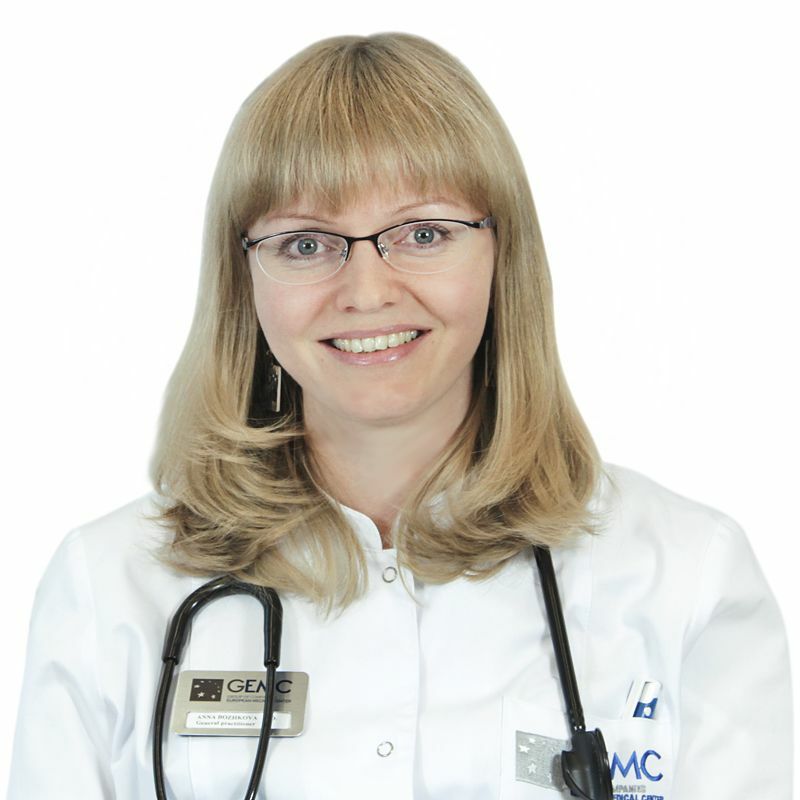 Doctor Bazhova had joined EMC’s team in February 2013. She started her career in EMC as a general practitioner of In-patient Department. She took part in three clinical trials in rheumatology (rheumatoid arthritis, giant cell arteriitis) hosted by EMC as chief coordinator and co-investigator physician. In April 2017, Anna Arturovna was appointed to the position of head of the 1st In-patient Department at EMC. She is a member of the Russian scientific medical society of therapists, Moscow city scientific society of cardiologists n.a. A. L. Myasnikov, Russian Association on osteoporosis, International Osteoporosis Foundation. Area of professional and scientific interests: internal medicine, osteoporosis, management of patients with comorbidities, complex patient preparation for surgeries, management of outpatient and inpatient, trauma patient management during postoperative period, including the program for osteoporosis prevention and treatment, both outpatient and inpatient programs for comprehensive assessment of the health status for men and women (check-up).